Next April my company, Georgetown Mortgage is going to be having a fundraiser for Heros Night Out to help them raise money for one of their functions: A kayaking event where veterans will learn how to kayak for purposes of recreation, fishing, or even white water kayaking. The kayaking event usually happens on the Guadeloupe River but they need kayaks for this event and my company, Georgetown Mortgage, wants to help them raise money for kayaks. Last year Georgetown Mortgage put on a car show here in Georgetown that included quite a number of vintage cars. This was fairly successful for a first time event and we were able to raise several thousand dollars for the Boot Campaign. This year we are excited to expand this event and since we are going to be raising money to buy kayaks, we are combining kayaks and cars for the event. Yes, that means YOU. 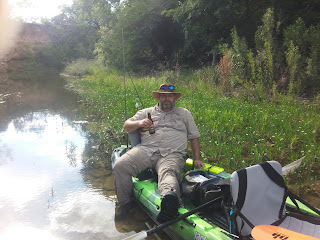 If you live within 100 miles of Georgetown Texas and you own a kayak, I'm talking to YOU. I need your help!! We are inviting as many kayakers as possible to come to the event and bring your kayak to show off. Not only will we have food, music, and cool cars to look at, we are going to be doing a.... Kayak Raffle as well! We are in the process of getting a high-end kayak to raffle off with all the goodies to fit it out. But to draw attention, we'd like to get as many kayakers as possible to bring their kayaks and display them with all their fishing gear, white water gear, or even ocean going gear! Or for that matter, if you own a fancy car AND a kayak, we NEED YOU! Also, we will be raffling off an high-end bass fishing rod and if enough people show up at the event, we'll have a fly rod to raffle as well! If you are a possible sponsor of this event and you are reading this then please contact me! More info will be coming over the next couple months but please, let me know if you are interested in bringing your kayak to show it off at the event! I need to know NOW since your participation will help us build momentum.